The sad thing about The Railway Man, a disappointingly bland war drama, is that it so desperately desires to be the new Bridge on the River Kwai. Of course, nothing can top the Oscar-winning Alec Guinness film when dealing with similar subject matter, but this film feels the need to up its game to even be in league with it and ends up looking like a pale imitation as a result. The story of Eric Lomax has been adapted for the screen before, with John Hurt taking on the role in the 1995 TV movie Prisoners in Time. This new film is more or less a big-screen remake, with exactly the same story and angle which makes things far too predictable and vanilla (though to be fair, the story is based on what happened in real life). The flashbacks to Lomax’s time in a Japanese POW camp are bereft of tension because despite the horrendous torture he goes through we know he makes it out alive. He remains deeply psychologically troubled, but still has his life intact so the various scenes of violence at the hands of Japanese soldiers aren’t as gripping as they want to be. There are times when the drama is overdone to a point where it becomes unintentionally funny. When young Lomax (played by Jeremy Irvine in flashback) admits guilt of constructing a radio, he is beaten within an inch of his life. A harrowing scene already, but the choices made to signify what a terrible ordeal it is are hilariously over-the-top. An angelic choir sings on the soundtrack as he is abused, presumably to make it sink deeper in to your emotions; various soldiers dramatically look away as if to say “Oh, I can’t stand to watch how incredibly poignant and shocking all this terrible violence is. This film pushes the edge!”; and, to top it all off, one of the soldiers starts randomly quoting the “Valley of the Shadow of Death” psalm from the Bible. When emotional manipulation is concerned, this is the cinematic equivalent of an Indian Burn. Though the writing and direction continuously struggles to find the right tone and frame of telling the story, the actors do a decent enough job with the thin material. Colin Firth as the older Lomax does well as does Irvine in said flashback sequences, and Hiroyuki Sanada impresses in a later role thinned by the script but expanded as much as possible by the actor. However, the talents of Stellan Skarsgård and especially Nicole Kidman are brutally underutilised with lesser-written roles that add very little to the overall drama of the story. Skarsgård’s only role here seems to be delivering exposition and acting out a convenient plot device before abruptly disappearing from the film altogether with a disturbing scene that comes completely out of nowhere. Kidman is given a larger role, but is again extremely limited by what the script instructs her to do. Her job here consists of reacting to Lomax’s behaviour and Skarsgård’s expository storytelling, and that’s about it. No time is given to develop her as an individual character and thus comes across as yet another stock “supporting wife” character we’ve seen a dozen times over. The overall payoff is anti-climactic at best, with ending text that feels all too similar to a much better Colin Firth biopic, The King’s Speech. Not that it was building to anything either way since much of the film is comprised of either melodramatic flashback sequences or informative dialogue, hardly enough to make us care about what happens next to these characters. This is a great disappointment because the real-life story of Lomax can be brought to cinemas much more efficiently, and while you have to admire the ambitions of the filmmakers we’re sad to say that The Railway Man is an overall unsatisfactory attempt. 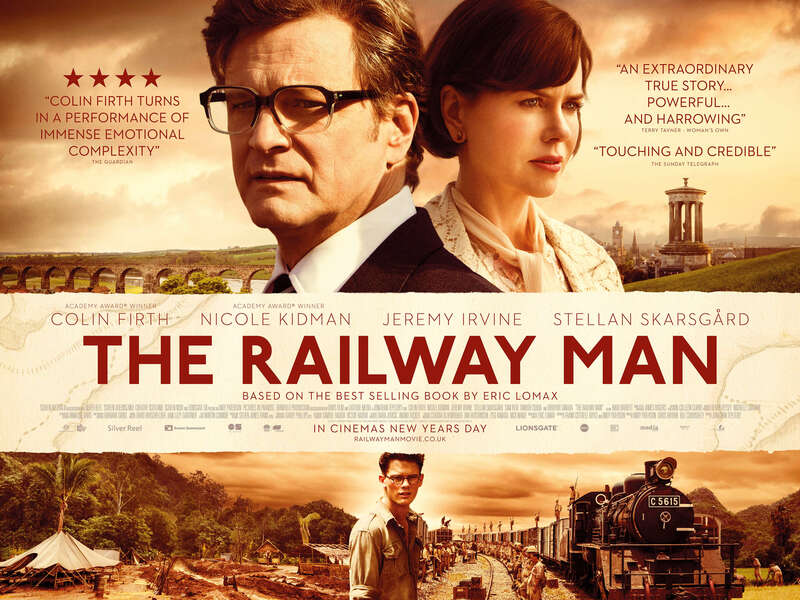 The Railway Man is a generic and uninviting war drama that makes little use of its talented actors and relies way too much on manipulative melodrama to force us to give a toss. Its attempts to shock you or make you cry succeed in the latter, but only because said attempts are unintentionally hilarious. For a true story to be depicted this way is disappointing, but not bad enough to be anything other than simply mediocre.